You've Finally Found the Seeds Pack You've Been Looking For and Here's How To Preserve Your Organic Vegetable Survival Seeds For DECADES and Eat Fresh, Delicious, Juicy Tomatoes/Watermelon/Vegetables And More Right From YOUR Garden! * I am THRILLED with the purchase. They were packaged well, and I received follow-up emails with hints and tips for growing vegetables!" * "I am REALLY impressed at the speed with which these seeds sprout AND the healthy looking plants that are beginning to grow!" * "you won't believe the amount of healthy, ORGANIC food you'll be able to produce from the number and variety of seeds provided. In addition, you are also provided with a lot of helpful information to get you started." Bonus: 32 Page Full Color Downloadable PDF - "Planting, Sprouting and Storing Guide" insures your success...even if you've never planted a garden before! 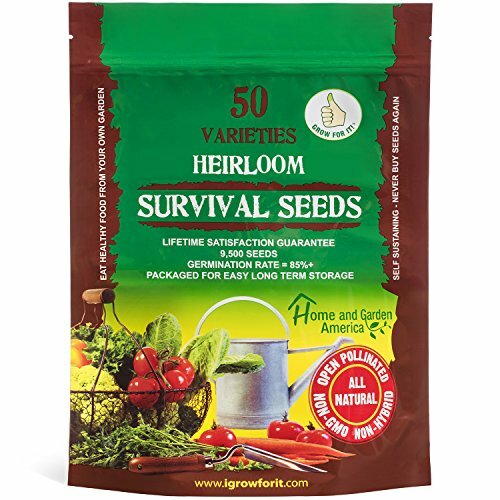 Whether you're preparing for doomsday or would just like to create an organic lifestyle, our Heirloom Seeds are the PERFECT investment for you and your family. Try it now, click the ADD TO CART button above to experience these seeds RISK FREE! If you have any questions about this product by Grow For It, contact us by completing and submitting the form below. If you are looking for a specif part number, please include it with your message.